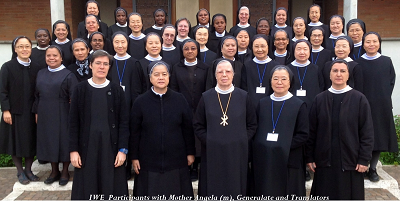 The International Weeks of Encounter consists of 32 Sisters from 13 priories. All were welcomed so graciously by Mo. Angela on April 13 along with prayer for all attendees. Sr. Aquinata presented with insightful conferences, presented the cultural, political, and ecclesial context of the times in which Benedict wrote the Rule. April 21 was a chance for some of the encounterees to be with the casa community for the launching of the third volume of Sr. Aquinata Böckmann’s commentary on the Rule of St. Benedict. The launching of her book was held at Sant’Anselmo. On the morning of April 22, the group went to the audience of Pope Francis at St. Peter’s. That afternoon Sr. Elizabeth Busbach and Sr. Marianne Slodowski celebrated their Golden Jubilee of Profession here at the Casa. Holy Mass was celebrated in a festive liturgy with the Sisters renewing their vows. Program was scheduled on the following evening. On April 23 some chosen Sisters gave the group their answers to the questions sent to us before the Encounter. Interspersed throughout the weeks we will be given a chance to share our own answers on how we have carried out particularly two of the four directions of the 12th General Chapter. Each of the priories and regions represented is also sharing a 15-minute power point presentation on its history and how it has led to Evangelization in the NOW. In the evening the whole casa community and encounterees gathered to present their numbers to the two golden Jubilarians. Golden Jubilarians Sr. Elisabeth and Sr. Marianne. It was an evening of surprises with lights, cultural dancing, songs in the different languages, many drums, costumes and good cheer. Sr. Elisabeth and Sr. Marianne both were involved in the dance, with enlivened spirits. Both gave their gratitude in response for the two days of honoring them in following Christ for fifty years. Sr. Hedwig will be our retreat director to our 5-day retreat from May 10-15. The last 6 days of IWE, May 19-25, will be spent in Tutzing. Having been here now for two weeks, this encounter with the different priory encounterees has helped me to see different ways that they have empowered themselves to the directives of the 12th General Chapter. During these days I have experienced the very richness of our Intercultural Congregation, and the joys each can express in her own language. I teach the RB in Norfolk, and have now a better view of Benedict’s culture and background.